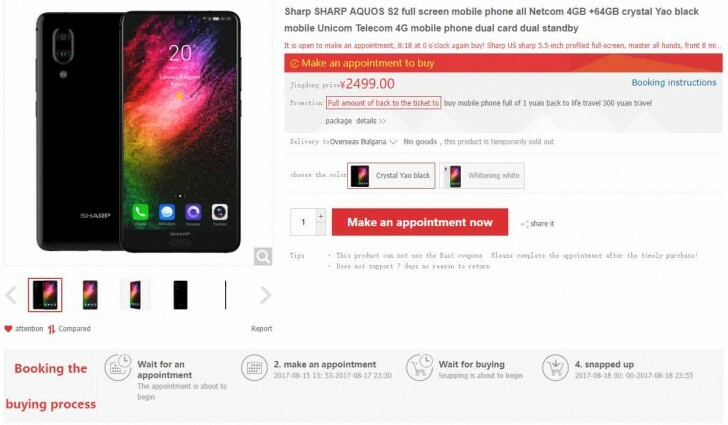 Chinese e-tailer JD.com started selling the Sharp Aquos S2 on the 14th and less than 24 hours later there are no more units left. There will be another batch available on August 18, but you’ll need to register first. The bezel-less phone is priced at CNY 2,500 locally for a unit with 4GB RAM and 64GB storage. There is an international version – CNY 3,300 for the 4GB/64GB model and CNY 3,800 for 6GB/128GB. That would translate to $490/€420 and $570/€485 respectively. Shipping is free, but there will probably be additional taxes related to the import. Not that there are international units available, those are sold out as well. Anyway, we’d rather wait for a local store to start selling those (though that may never happen).